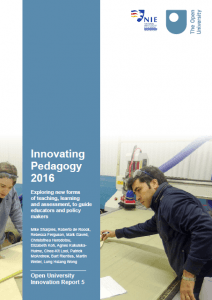 Innovating Pedagogy 2016 is the fifth annual report from the Open University (this year in collaboration with the Learning Sciences Lab at the National Institute of Education, Singapore) highlighting new forms of teaching, learning and assessment with an aim to “guide educators and policy makers”. The report proposes ten innovations that are “already in currency but have not yet had a profound influence on education”. In other words they are at an early phase of the Gartner Hype Cycle. Whether any will become, in the current idiom, ‘normalised’ remains to be seen and some scepticism would be advised. 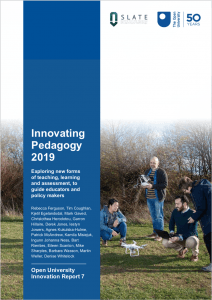 However, as I noted when the 2015 version was published, such reports often frame the discussion around technology in education, even if initially only at the level of “buzz-word bingo” for enthusiasts. I’ve blogged previously about the work that Jisc are doing in the field of learning analytics. Whilst there are some good case studies within the sector, informal conversations have indicated that most institutions are really only at the start of their analytics journey, or even simply keeping a watching brief on how the sector as a whole will act. Where institutions do have systems in place, they are often based on quite limited data sources (typically attendance data, VLE usage or library usage) rather than more holistic data sets covering a range of student experiences. A comprehensive picture of the current state of play is provided by From Bricks to Clicks: the Potential of Data and Analytics in Higher Education, a Higher Education Commission report which summarises the field and provides recommendations to institutions. A small number of pioneering institutions (Nottingham Trent, Open, Edinburgh) feature heavily as case studies, but the general argument is that universities are generating significant amounts of data about learning but are not yet in a position to use this data to support student success. At UCL, early discussions around the use of analytics have started. Our retention rates are generally good, but there is a feeling that students may leave their course due to social or economic factors – perhaps living in poor accommodation, feeling isolated, having financial difficulties or commuting into London. We think we might need quite a large dataset to model these parameters (if they can be modelled at all) although it is possible that attendance would be a good proxy for them. Certainly our journey into learning analytics is only just beginning. It’s that time of year again. Every year the NMC Horizon Report examines emerging technologies for their potential impact on and use in teaching, learning, and ‘creative inquiry’ within the environment of higher education. The report, downloadable in PDF, is compiled by an international body of experts and provides a useful checklist trends, challenges and technologies in the field and provides a useful benchmark of what is most talked about at the moment. 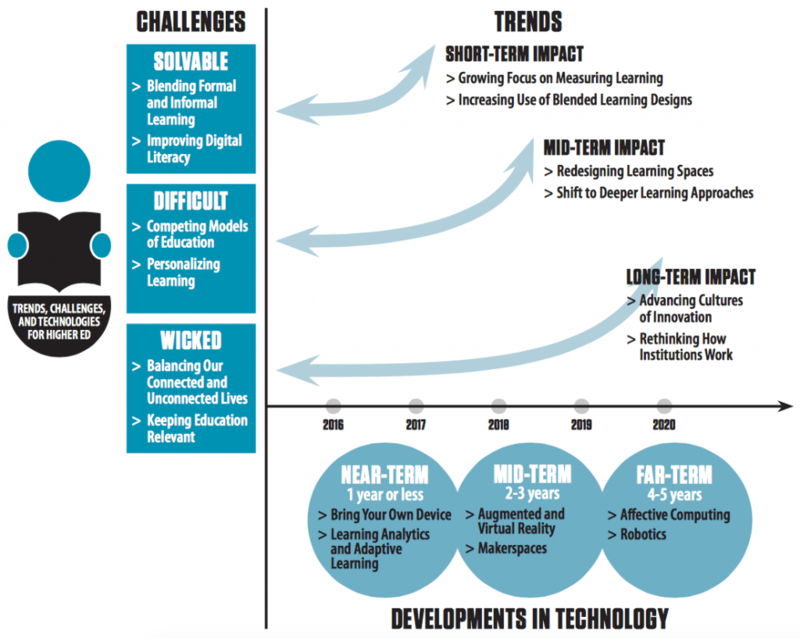 Longer term trends are: advancing cultures of innovation, rethinking how institutions work, redesigning learning spaces and a shift to deeper learning approaches. More difficult challenges are; competing models of education (e.g. 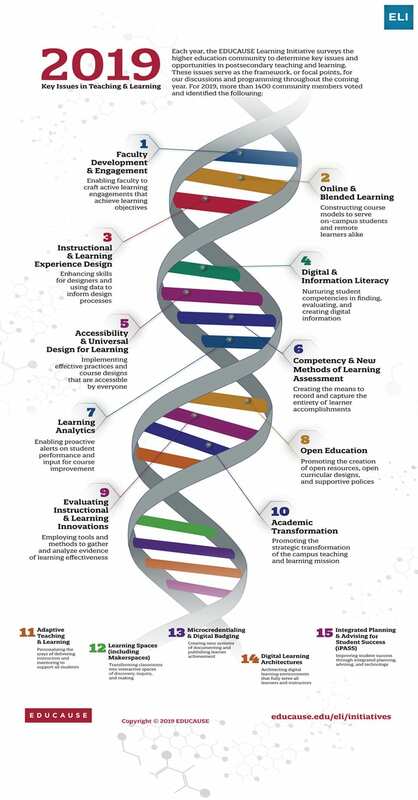 competency-based education in the US), personalising learning, balancing our connected and unconnected lives and of course keeping education relevant. “Rewarding teaching”, from last year seems to have been, ahem, solved. Longer-term innovations are; augmented and virtual reality, makerspaces, affective computing (interpreting/simulating human emotions) and robotics. As usual there are useful commentaries and links throughout. Once again, encouraging that quite a few of these ideas are already being implemented, trialed and discussed here at UCL.